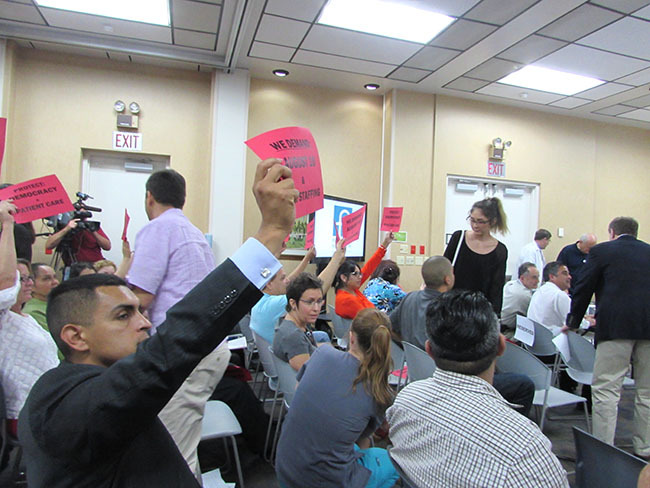 ESCONDIDO — The Palomar Health Board of Directors voted to close the Palomar Health Downtown Campus on East Valley Parkway at a special meeting Wednesday night. The board spent three hours in closed session to discuss the shut down. Board members decided to close the hospital because they said there isn’t enough money to make major infrastructure improvements. “I can assure you first and foremost as I’ve said throughout the entire process, was this the right recommendation for the right reasons at the right time? Yes,” Robert Hemker, president and CEO of Palomar Health said. The services will be consolidated to the downtown Palomar Medical Center on West Citracado Parkway and to Pomerado Hospital in Poway. Inpatient rehabilitation and labor and delivery services will move to the new Palomar Medical Center. Hemker said Palomar Health will move some staff to the other hospitals where there is a match and provide training to those who need it to continue on at the new hospitals. Not all of the 850 staff members will be relocated. “In the event (relocation is) not available to certain individuals, we will obviously work with them in terms of helping them identify where their skills can be applied and where they can be committed individuals at their new organizations,” Hemker said. Paul Neustein, M.D., Pomerado Hospital chief of staff supported the decision. He sits on the capital allocations committee, which prioritizes which equipment to buy. “The committee has become a theoretical committee because we aren’t able to purchase anything because there is no money available,” Neustein said. Hospital executives said the closure could save Palomar Health $20 million a year. The board spent $1 billion on the Citracado campus, which was opened in 2012. In 2004, more than two thirds of voters approved Proposition BB, which allowed the hospital to take out nearly $500 million in bonds. Some staff and residents spoke against the closure, because they felt the decision was intentionally rushed. Hospital staff announced the discussions for the closure on June 11. Four community meetings were held to allow the public a chance to learn more and give their opinions on the closure. Some see the closure as an opportunity to convert the 319-bed facility into new housing. “This proposed decision should be looked at with fresh eyes as a great opportunity to revive and change the look and use of the property at the end of Grand,” former Escondido Mayor Lori Holt Pfeiler wrote the board. San Marcos Mayor Jim Desmond agreed with the closure. “Palomar Health is taking the steps necessary to ensure the patients continue to have high quality care, therefore it makes sense to consolidate,” said Desmond. The hospital was built in 1950 and some staff said the building was too far gone for repairs. Facilities Manager Bill Ruffin told the board the boilers are running at 65 percent efficiency. He spoke in support of the closure.